It’s the age old question, should I use a VPN on public Wi-Fi? In this guide I’m going to answer that question once and for all but not only that, explain the reasons why. This guide will show you the reasons why you’ll want to use a VPN on public Wi-Fi in easy to understand language without the complicated technical jargon. Public Wi-Fi is great but if you’re like me there’s always that air of apprehension. It’s often free and when anything is ‘free’ it’s always recommended to be wary. Your internet usage and data could now be claimed to be more important than your household goods. Allowing someone to gain access to your online accounts or identity could lead to months or even years of problems and misery. Public Wi-Fi is any Wi-Fi system that isn’t in your home. You could even consider Wi-Fi in a friends house to be “public” Wi-Fi because essentially it’s a Wi-Fi point that you don’t control or have control over who connects to it. Hotels, Motels, Hostels & Guest houses. Parks, meeting areas and other open spaces. Airports, Bus Stations, Service Stations and other transport hubs. Public transport such as Trains, Coaches and Buses. You will find public Wi-Fi in many different places. As long as it isn’t the Wi-Fi system in your house, you should consider it ‘public’. Should I use a VPN on public Wi-Fi? Without question, the answer is Yes. You should always be using a VPN when connecting to public Wi-Fi. There are three basic reasons why. Public Wi-Fi is not secure. You don’t know the other users on the same Wi-Fi network. You don’t know those running the service. Let’s take a little look at those in detail. Public Wi-Fi is not secure, Public Wi-Fi is not secure, Public Wi-Fi is not secure. Remember this every time you’re tempted to connect to a public Wi-Fi service. When you’re using the internet we call all the information that is passing through it “data”. This “data” is made up of a mixture of plain readable text, like this guide and data that is “encrypted”. Encrypted data is basically information that is jumbled up making it unreadable. Depending on what you’re doing depends if the data is plain readable or encrypted. Any data that is plain readable can be read by others. Not only by the owner of the Wi-Fi network but more importantly by anyone else connected at the same time. A VPN from a provider such as ExpressVPN makes sure your data is encrypted 100% of the time. So it doesn’t matter if what you’re doing is plain readable data or encrypted data. A VPN makes it all encrypted which in turn makes it safe and secure. 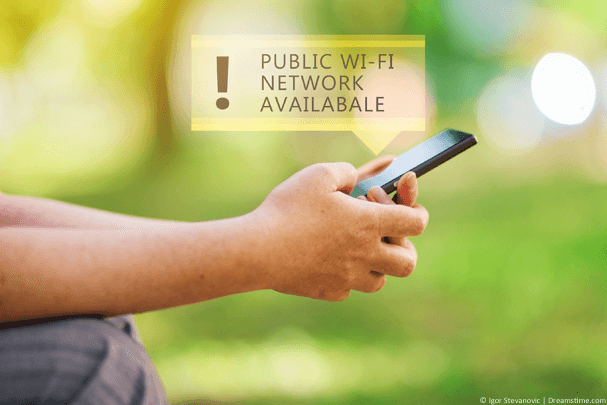 Connecting to Public Wi-Fi is a bit like a lottery. It often depends on who else is connected to the same Wi-Fi network. It’s those users who could be potentially monitoring what you’re doing. A VPN protects you from this. It’s important to remember as you glance around the coffee shop that not everyone in sight will be the only ones connected to the network. Wi-Fi signals extend some distance and with the right equipment, a nefarious hacker could be out of sight connected to the same network monitoring your usage. A VPN will protect you from this. Most hotels, cafes or other public Wi-Fi networks never change their password or even worse are open networks. That means a hacker or ne’er-do-well can continue to log into the same network over and over slurping up other users’ information. While other users can be a problem you also don’t know who is running the service. This can be more of an issue than individual users connected to the service. It’s possible for those running the public Wi-Fi service to also log and monitor what you’re doing. You have no way of knowing what readable data they’re harvesting. It’s certainly possible for them to read your personal emails, see your chat messages or at worst it has been known for someone to be able to log into your Facebook profile at the same time as you. Again, a VPN will protect against all of this. If you’re wondering if you should use a VPN when connected to public Wi-Fi then the answer is a resounding, Yes. Choosing a VPN service is like choosing an internet service. You need to make sure you choose the right one to get smooth and hassle-free internet access. Basically, VPN services are split into two camps, free VPN services and paid VPN services. Free VPN services are ‘free’. That’s an obvious plus and one you’ll definitely be interested in. However, your internet service provider isn’t free, so why should a VPN? It’s a good question. Running a VPN service is expensive, the providers need infrastructure, marketing and everything else involved with running a business. So how does a free VPN service offer the service for free? Generally, you become the service. Just like public Wi-Fi they’ll often inject tracking systems to monitor your usage. They’ll then sell this data to pay for their service. Free VPN services that are reputable are often incredibly slow and have tiny data usages. The upshot is they want you to upgrade to their paid service. My recommendation is, you avoid free VPN services unless for testing with a view to subscribing to the full service. Paid VPN services are much more reliable and you get what you pay for. There are however more than 500 individual companies across the world that sell VPN services so it’s important to choose wisely. Like anything, there are good and bad services. I personally use ExpressVPN because not only do they support a greater range of devices but they’re also one of the easiest to use. With connection points in more than 94 countries they’re also suitable for use for protecting your Wi-Fi usage across the world. Without question the best way to secure yourself when using public Wi-Fi is to use a VPN from ExpressVPN or one of the other recommended providers. However, there are a couple of other tips that will help you stay ‘safer’ on top. Turn off Wi-Fi auto connect. …Or better still, turn off Wi-Fi. Turn file-sharing off on laptops etc. Only use public Wi-Fi for none personal purposes, reading the news etc. Always keep your devices and apps up-to-date. No single ‘tip’ can replace the security that a VPN can bring. If you want to stay secure while using public Wi-Fi then I recommend using ExpressVPN or one of the three providers listed above. If an app VPN service is too fiddly to use then there are decent hardware solutions available. The InvizBox Go is a small portable device about the same size as a phone which creates a Wi-Fi hotspot secured by VPN technology. Rather than you connecting to the public Wi-Fi connection, you simply connect to the InvizBox Go. The InvizBox Go can then be set-up to connect to the public Wi-Fi connection acting as a VPN security middleman between you and the dangerous public Wi-Fi network. The beauty of the InvizBox Go is not only will it keep you safe and secure on any network but you can even recharge your phone fully two times with its power bank feature. You can find out more or buy the InvizBox Go here. If you use public Wi-Fi either frequently or infrequently then it goes without saying, Yes, you need to use a VPN. Whether that be a free VPN, a paid VPN or a hardware solution like the InvizBox Go is entirely up to you. If you’re a low-usage or high-usage user of public Wi-Fi then I recommend at the least get yourself an app based VPN service such as that offered by ExpressVPN. If you’re a heavy user of public Wi-Fi and you don’t mind to spend a little cash upfront then the hardware solution the InvizBox Go is the daddy of all security solutions. Whatever you end up choosing, always remember to use a VPN of some sort when connecting to public Wi-Fi.